The church and the adjacent Old Rectory will be open during the Open Doors weekends in early September. Guided tours and refreshments will be available. 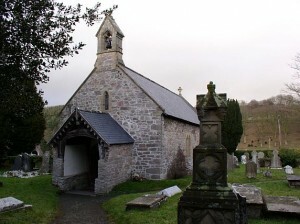 This tiny church in a remote valley is thought to have its origins as a monastic community, possiby founded by the monks of Searan from Llanynys. It is of Celtic origin, first recorded in 1253, and built on the site of a “llan”, perhaps as a monasry, ministry, or hermitage. Features include the ancient entrance door with original latch, hinges and door knocker, 16th century roof timbers, and English Gothic east window (1290-1350), reglazed in 1984 by specialists from Ruthin Craft Centre. Inside are the remains of very precious early wall paintings, interesting memorials, and a unique wooden font. Copies of the Parish Records from the past three centuries will be on display, and guides will be on hand to give information on other buildings of historical interest nearby. Next to the church is The Old Rectory (c1720, extended 1810). Early incumbents include the Reverend Elias Owen, author of “Old Stone Crosses of the Vale of Clwyd” and “Welsh Folk Lore”.